Blending sci-fi, comedy, horror and "real talk", 'Attack The Block' is a uniquely entertaining and quintessentially British romp. First time director but long time funnyman Joe Cornish has successfully made a low budget, high concept feature, inspired by Luc Besson and Steven Spielberg. Cornish is well known in the UK for his comedic radio/TV shows with collaborator, Adam Buxton. Buxton isn't involved in 'Attack The Block' - instead we have aliens invading and yoofs running amok and dat. Innit. Dialogue is key in this film. For a Londoner like myself, the colloquialisms are a joy to behold. However, I asked Cornish in a post-screening Q&A, if there was any concern that the language would not be understood elsewhere in the UK, let alone across the world. Cornish believed that the lexicon of the film was succinct enough to be understood clearly by any audience, comparing it to the Nadsat language found in 'A Clockwork Orange'. Of course, the art of storytelling is a universal language and Cornish's story is both exciting and easy to follow. Aliens land on a Sarf Lahndan council estate. A gang of teenagers find one of the aliens and merked it. (In this context, that means they killed the aliens. Got it, fam?) The aliens then try to do the same thing to any human that gets in their way. Some established actors are on hand (most notably, Nick Frost and Jodie Whitaker) but the real stars of the film are the young gang members. Most of whom were plucked from drama classes and workshops. Their youth also lends a certain plausibility for the dialogue, some of which was cribbed from real life conversation - including the brilliant "this is too much madness for one text!" line. Of particular note is John Boyega, who portrays the leader of the group, Moses, manages to display the tortured essence of his character underneath its outwardly tough shell. Alex Esmail as Pest is also excellent but not one of the younger members of the cast puts in a weak performance. Luke Treadaway deserves plaudits for his role, a perfect pastiche of a posh guy trying (and failing) to fit in. Cornish's writing works well but with the horror ambitions of 'Attack The Block', it would have been disastrous had the portrayal of the aliens been timid. Thankfully, despite the limited budget, Cornish's dark vision of the savage aliens and competent direction make for several tense moments, complemented by the snarling soundtrack by Basement Jaxx. One of the few gripes I have with 'Attack The Block' is that despite its aim to provide a different view of young black teenagers and life on a council estate, it still treads the stereotypes. The gang mug a defenceless woman at the beginning of the film and much of the film is embedded in drug culture. I realise it's hardly 'The Wire' but I question the need for those tropes. If you enjoy sci-fi and can decipher the dialogue in the trailer then you should enjoy 'Attack The Block'. It's a film that manages to be both visceral and witty, something that deserves high praise. Plus Joe's dad approached me and complimented the Q&A question that I asked above, which was the nicest thing anyone's done for me in ages. So here's to you and your son, Mr Cornish. Believe, bruvs. 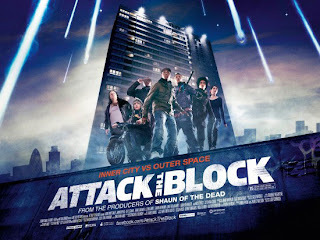 'Attack The Block' is out in UK cinemas today. Thanks to Volkswagen's See Film Differently for giving me the opportunity to not only see the film last week but also engage in a Q&A and meet some of the cast members.